Norway is located in Northern Europe and is a part of the Scandinavian Peninsula. The majority of the country shares a border with Sweden in the east and its northernmost region is bordered by Finland. With a population of nearly 5.258 million, covering 323,802 square kilometers, Norway is one of the most sparsely populated countries in Europe. Norway has one of the most financially healthy economies in the world, in part due to its status as the world’s 11th largest exporter of crude oil and 3rd largest exporter of natural gas. It has a GDP of $398.8 billion in 2017, which has been decreasing the past several years. Other major industries, such as shipping, shipbuilding, fishing and fish farming, information technology, pulp and paper products, and light metals processing have prospered as well. Incomes are also more evenly distributed, making every person a consumer, unemployment rates and interest rates are low. Norway has close ties to the United States, the overall economic and trade relationship is strong, and Norway’s import climate is generally open and receptive to U.S. products and investments. In 2018 the United States exported $5.45 billion, making it the United States’ 43rd largest export destination. Top exports included: transportation equipment (39.7%), oil and gas (16.2%), non-electrical machinery (8.8%), and computer and electrical products (7.3%). Also, in the same year, the United States imported $6.7 billion, and top imports included: oil and gas (25.7%), petroleum products (17.9%), and primary metal manufacturing (10.2%). In 2018, California exported $1 billion to Norway. 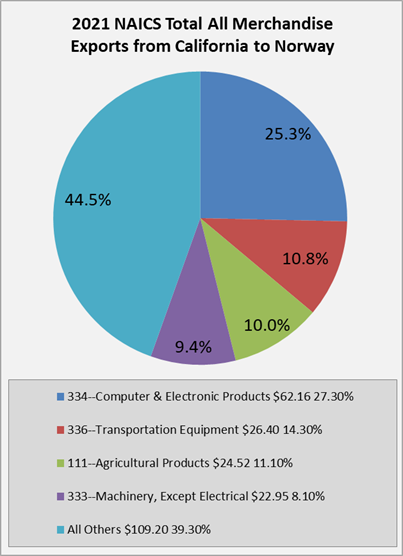 Top exports included: transportation equipment (81.9%), computer and electrical products (5.2%), and agricultural products (2.3%). Likewise, Norway exported nearly $411.6 million to California. Top exports included: other animals (36.4%), chemicals (18.5%), fish, fresh/frozen and other marine products (15%), and computer and electronic products (8.8%). The numerous areas that affect trade and investment between Norway and California were the subject of a lively exchange on September 15, 2016 at a luncheon meeting between the California Chamber of Commerce, Parliament of Norway, Consulate General of Norway, and the Northern California World Trade Center. The lunch was part of a weeklong tour of Northern California by the Norwegian Parliamentary Standing Committee on Commerce and Industry. On May 27, 2015, the California Chamber of Commerce held an International Forum on the Transatlantic Trade and Investment Partnership and the Transpacific Partnership with speakers including members of the United States Chamber of Commerce, representatives from five American Chambers of Commerce from abroad, and two ambassadors. Also in attendance was a delegation totaling 25 members of the AmCham community representing Bulgaria, Croatia, Denmark, Estonia, France, Greece, Ireland, Israel, Kosovo, Latvia, Lithuania, Macedonia, Norway, Poland, Romania, Serbia, Slovak Republic, Slovenia, and Turkey.